Hampden Hon! Talk about lights!! What a town! Now, this house, 2nd on the row, invites visitors to go up the stairs to see the wonder of moving trains on the porch and since the door is open to the residents watching tv, one can look into their living room and see the train moving around their ceiling circling their personal tree! This one is AWESOME up close. Or would you prefer a tree made of hubcaps? or a tree next door made by a working artist who uses food containers to create his creatures... such as Bohemian Beer cans, Old Bay Spice boxes and wrenches, bike gears, whatever. He had a holder with his business cards next to his yard. A pile up on -83! Hate a traffic snarl, don't you? Guess this guy saw the worst of it, or it's a bear skin rug after Christmas proper. We visited a few days after Christmas so not all homes were in top flash. But check out gumby Santa making an arch over this stairway!! This yard just was FULL of inflatables. So much hot air it reminded one we live near the home of politics! Except this is Baltimore, home of weird fun! We weren't alone this night, even in the rain, families were posing with their favorite house, kids and adults under umbrellas. SPCA pet love house is coming up! Love the balcony! And the pictures of real pets waiting for their forever homes! This street is awesome but there were lots of cool lights around the 'hood and we plan to return in the Spring to have a bite at an outdoor cafe and walk around looking at a cool town. Want to see more lights?? Laugh a bit more at the silliness?? Keep scrolling down to the week of posts y'all! Remember Radio Flyers? A little red wagon, most of us had one or a friend with one. This one is little, holding even littler snowmen scent burners. I want one to hold my ornaments but it's a display. Look at this pretty window display! These three are the Annapolis pottery shop. On Christmas night we drove to Annapolis to walk around and see what was shakin'. It was very active with a few open restaurants and many people walking around like us. There's something special about looking in pretty storefronts at night. I am a visual person and respond to creative displays. This is so happy, I want it, even though I don't burn scented oil. Cole had to check out this cozy alley, with tons of snowflake lights. I haven't seen this before, but, nothing is too small to decorate! Same with quilts, no quilt is so small that the details aren't worth dithering over. Cole, who walks at a snails pace in our neighborhood, was all kinds of excited to walk downtown. look at this used bookstore display of old books making a tree. How creative. I just love this sign!! If you have trouble reading it, click on the image to enlarge it. how about this sign..."leave me alone I'm only speaking to my dog today"
I showed you a boat decorated with lights, a boat in a yard decorated with lights (click here for that! ), and now this Pig-in-a-boat. Followed by a yoda with light sabre, and a rooster. "German" market. It was miserably cold and rainy, and quite a few stalls had packed up and left... so sad... but we heard a four guy band called "go FOLK yourself" and I thought, well, good for young people to be accomplished musicians and keeping the art of folk music around. This is a view, through the gondolas to the National Aquarium lighted up like a drive in movie screen! And the ubiquitous hard rock cafe. I found a lovely little Russian doll for the tree though and since we paid for two hours parking we walked on around the harbor. I had a wonderful time chatting with the proprietor about just the most tacky thing in his shop. Not only was he not offended, he helped me decide on just the right item. He did suggest a wiggly plastic fridge magnet crab but you'll have to check back later for the one I chose, hee hee. Walking back to the car, we saw lots of lighted brownstones, very quirky as the area is. Very moody with the mist and cold. I loved this one near the Bocci Ball court, with the vintage santa light strung up across the sidewalk. can you click on it to see the wee little bears having a Christmas feast? Someone lovingly set this up for me to enjoy! Thanks! I like how the bench is decorated along with the window. If you have it, you might as well decorate it. I am a Florida transplant, and don't expect to see this kind of fun in the Mid-Atlantic so as we approached this yard, done up like a Chevy Chase movie, and then spied a palm tree with at least a dozen flamingos who could blame me for pulling over and traipsing through their yard?? "Jiggle my Globe!" 2014 12" X 12"
would be perfect, and as I cut it, and positioned it, the piece grew til it grew up to be 12 inch square. I like leaving Betty with no background, just the globe (two layers of tulle with gold metallic stars) and halogram sliver thread around it. I free motion quilted with mylar thread, did a machine binding with a couched thread and a row of satin stitch. Added crystals, hope you can see them if you click on images to enlarge them. Little santa made his way into the picture too. I think all my snowglobes are done for this year. Many have flown around the world making their way to friends. I kept some as I've fallen in love with them. Whew! All this Christmas running around has been exhausting. Time for a nap! I decided to take a rest. I'll be ready to play again when they get home. for the quilters reading, the quilt over Cole has a history. It is small because it's all the leftover bits and pieces from a large Weaver Fever quilt. The original one was maybe the third one I ever made, back in the 80's. I hand quilted it with metallic thread and hand drawn ornaments. It is lovely and I still have it because the person I was making it for ended up not being quilt worthy.Know what I mean? There's enough to go around! Sheesh! You'd think it was Christmas or something! Whew! We went to the mall and found a parking place! Yea! An omen! And yep, it was fun y'all. Not a nightmare, but fun! We were together and mostly able to walk side by side holding hands. We visited the Clinique counter for my purchase and free gift! I even noticed the giftwrap on the counter and asked them to wrap it for me. It won't be a surprise but it will be sparkly until Christmas morning. This is a gratuitous picture of a Jack Russel for my friend Val here! You can find this pillow at Pottery Barn. I would like to just move in, close the doors to the shoppers and move in. It's so pretty and would be way too large scale for our house. We purchased some more snacks from Hickory Farms and some Teavana specialty teas for the holidays. While at Macy's we saw this yarn ball tree. What!?! Any knitters out there, want to come make a pair of tree socks? Hee hee, goes great with my collection, aaaaaand the freshly purchased Featherweight Sewing machine bought from a neighbor. I'll just make a whole post out of that baby soon. For once I thought of a great gift for Drew, (more later) so we are recreationally shopping at this point ! and enjoy all the fun. Because of less than stellar behavior, Cole is baby gated into the living room when we leave the house. This is his view while reclining on his sofa. This and the bay window turned to the squirrel channel. I adore this little pink tree. I added some garland from Crate and Barrel of crystals this year and now all our Christmas cards are under it. It is the first thing, other than clutter I see when I come in the door. I found this little diary mid year and thought I would put it in my purse and use it. No, too good to use. Then you use it up. note to self: you're worth it. Anyway, it won't get tossed, as the year doesn't matter to me. I will use it as a little special notebook. I'm in love with the graphic. I collect ornaments on all travels and whenever I find a great one. I am lucky to have quite a collection at this point, some of which stay up all year (cow in cowboy boots) Note the ballerina pig. I have ballerinas in cows, pigs, people, flamingos, because I studied the ballet as an adult for MANY years. I loved it but wasn't particularly built for it. So what! I love dance. Too many injuries to do it now but I fondly remember hour after hour in pink tights. 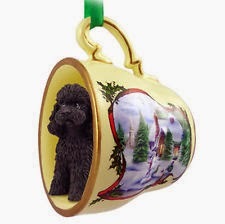 Doggy Snowglobes too! And one for you! What are you going to make with that fabric?